I moved into a rental house and of course my landlords were very nervous about letting me paint. They told me no crazy colors! I have an older kitchen with wooden cupboards and tan countertops. I was not allowed to replace the counters so I had to work with what I had. I choose a color in the tan family, a little on the darker side. The color I picked helped bring out the colors in the counters and accent the cupboards. My mother actually had this paint color left over from her living room and I thought it would look great in my kitchen, so I did it. 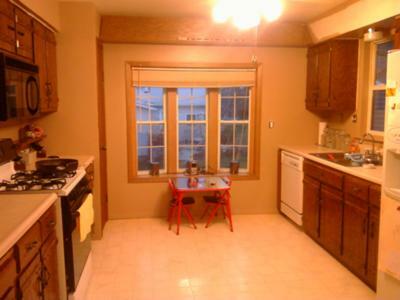 I was worried at first because the color was sort of dark, I thought it would make my small kitchen look even smaller. But it looked fantastic. I was going for a country look and definitely got that result. After painting I added some green plants and sunflower decor. I think it is beautiful. P.S. The brand of paint was Glidden and it was semi gloss. This tan color just works so well with your wooden kitchen! I think this looks really good. I am not a huge fan of neutral paint colors but after seeing this warm tone on your walls, I might have to reconsider! Return to Neutral Paint Colors.